David and Michelle Holzapfel established their Marlboro studio and gallery, Applewoods Studios, in 1976 on VT Route 9 in the southern Green Mountains. They specialize in Vermont’s spalted and burled hardwoods to make one-of-a-kind, handmade/ handcarved furniture and vessels. Their work has been acquired by museums, businesses and homeowners throughout North America. Craft in America's Nature episode features Michelle Holzapfel. The NATURE episode PBS premiered Friday, April 21, 2017. Michelle and David Holzapfel in conversation with Gregory Sharrow at Mitchell-Giddings Gallery in 2016. Excerpt from video "Michelle Holzapfel: Woodturner and Carver" by Marlboro Productions. Shared by the Museum of Arts and Design. 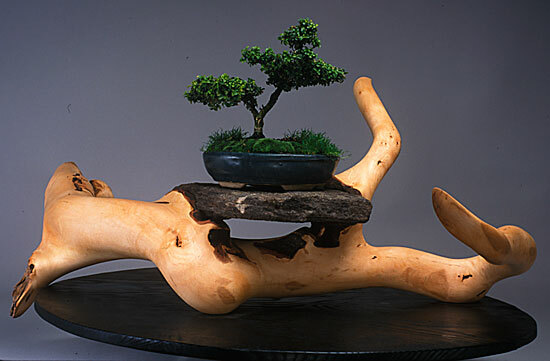 Article: “Art Inspired by Nature: The Sensual Work of Sculptor and Furniture Maker David Holzapfel...” The Gardener’s Eden , Harlow, November 4, 2009.